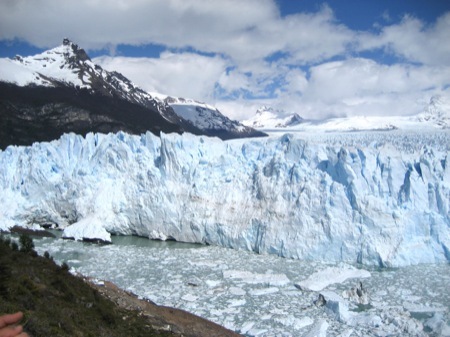 Any Patagonian traveler will tell you, Perito Moreno Glacier is the must see destination. Following the advice of fellow travelers I met along the road, I rolled into town on a cozy full cama bus at 2am (a bus with full beds). I was thrilled to see the Albergue and Hostal del Glaciar van patiently awaiting our arrival at the bus station, and after grabbing my human size backpack I jumped in the van and was escorted to the hostel. I was impressed with the hostel and would definitely recommend it – clean, well organized, and friendly. Within the first 15 minutes of arriving I had booked a tour to the National Glacier Park and was comfortably settled in my room. I knew my body would need a little rest the next day so I opted to spend a day getting to know the town before heading to the glacier. El Calafate is a small town, primarily made up of travel agencies, local boutique shops selling hand made art from the indigenous Mapuche people, and restaurants. It is a cute and quaint town to spend a day, but I wouldn’t recommend staying much longer unless you are looking for a low key place to relax. I did enjoy looking at the leather canvas paintings that were scattered in many shops throughout town and that screamed “Buy me! I will make a great gift” as I window shopped and contemplated whether I would be kicking myself later for buying a rolled up canvas that didn’t fit in my backpack. (I bought it, great purchase). 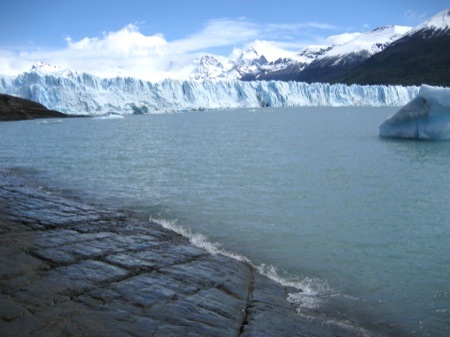 Following an asado and a glass of wine at a local pub with the token Argentine gaucho singing and strumming his guitar in the corner, I was ready for bed and looking forward to my early morning at Perito Moreno Glacier. Once again the organized Hostel services were very well appreciated. My excursion included a guided tour through the country leading up to the glacier, a couple of hours to view Perito Moreno glacier from the balconies and a hike around the area, and an up close and personal view from a boat. (Trekking on top of the glacier is also an option). The bus arrived at 9am and we were off. The tour was excellent and the guide very knowledgeable. The ride leading up to the glacier was shocking and impressive due to the dramatic changes in terrain. We saw all kinds of wildlife along the way – ranging from the high flying condors to the pretty in pink flamingos. The moment we turned the corner and Perrito Moreno came into view was breath-taking. As we got closer and closer I couldn’t help but feel that we were driving into a movie scene where the whole Earth had frozen over and was locked inside the huge pieces of ice. I just stared in awe and before I knew it I was standing on the balconies that look out over the natural wonder and enjoying the fantastic views. The physical beauty would have been more than enough to bring everyone to silence, but in combination with the sounds of the ice crackling right before your eyes and ears, it was more than words can describe. The crowds anxiously watched and waited to witness the one big piece that would fall from the top of the towering mass that day. I saw multiple pieces come crashing down into the water, forming big waves and leaving their ‘footprints’ in the water below. However, there was one big one that I will never forget…incredible. The views from the boat gave me a completely different perspective. 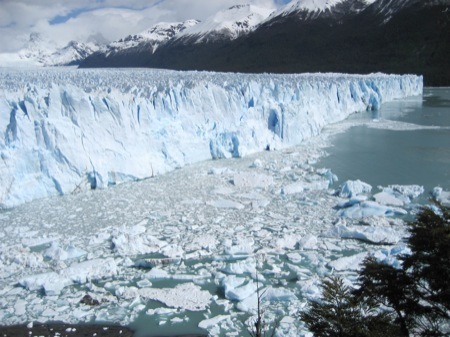 The magnitude of the glacier was much more apparent and the impact that much bigger as well. The tour flew by, and I had no idea we had been gone all day. It was most definitely one of the favorite parts of my trip and I am so thankful I was able to see it. I am thankful for the advice of other travelers who told me to make it a priority even though it is not an easy place to get to, and I will continue to pass that advice along to others. Very informative. I am just starting to plan a trip to Argentina, a country where my geologist-husband has worked for several weeks years ago. Thanks to all. This page rendered in 0.012 seconds.